The iMicro mini microscope is designed to attach to your smartphone camera, which helps you catch a glimpse of microscopic world. Cool? Let’s keep checking. The iMicro is an innovative mini microscope that measures 1 x 1/2 x 1/8 inches and weighs 1.5g (approx. 1/20 oz). As we can see from the images, the microscope shows off a similar size with your finger tip, so you can effortlessly take it with you and step into microscopic world with your phone and Fingertip anytime and anywhere. The smartphone microscope features a complex multi-spherical lens with a dedicated design to achieve both the high performance of magnification and low aberration. Using the micro-lens and a combination of three stages of magnification, the iMicro is definitely comparable to a desktop compound microscope. Furthermore, integrated light guide technique uses smartphone’s LED flash to illuminate the sample for a clear view. An included μRuler helps you measure the micro objects, while its custom companion app takes micrography to meet professional demand. 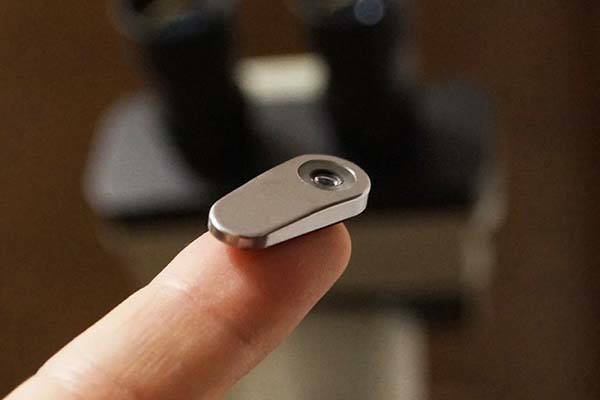 Moreover, using integrated nano-pad, you can effortlessly attach the mini microscope onto the rear camera of your phone. The team behind iMicro is raising fund for the product on Kickstarter. We can pledge $29 to preorder the mini smartphone microscope. It will be shipped in December 2018.